Kochi, June 17: There has been a sound note of applause for the Sarsanghachalak of Rashtreeya Swayamsevak Sangh, Mohan Bhagwat, from none other than Justice VR Krishna Iyer. The retired SC judge has applauded Mohan Bhagwat's role in intelligently resolving the recent crisis faced on the national political platform. 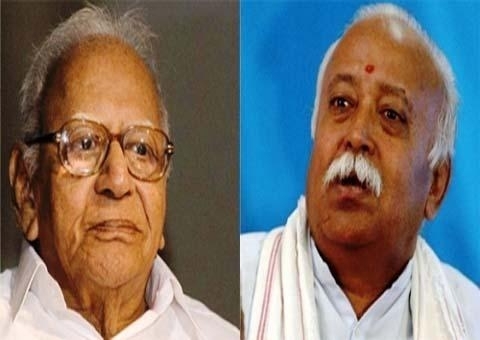 In all humility, Mohan Bhagwat responded to the message conveyed by Krishna Iyer as 'reverential advice which has eternal value on any social platform." Hailing the Sarsanghachalak's move as that of a brilliant statesman, Krishna Iyer wrote a laudatory letter to him, adding that he had written two separate letters to LK Advani and Narendra Modi, following the brief crisis that created a stir in the national political scenario, following the resignation of Advani. As soon as news of the crisis broke out, the RSS Sarsanghachalak had taken matters into his hand and spearheaded the initiative in resolving the crisis. I do not know you personally or politically. Nor do I align myself ideologically with the RSS. But I have always held in respect, the nationalistic dedication, untainted love for the country and the spectacular observation of the nation's cultural ancestry that a Sangh activist has in him. Congress has become a national disaster after the death of Nehru. There is no one after him who has been upholding the values specified by the constitution. May Sree Buddha, Swami Vivekananda and Gandhiji save us. You have displayed an example of brilliant statesmanship by ushering in equanimity when the brief political crisis took place recently. After a careful study of the current scenario, I have written to Modi and Advani separately. While writing to Advani, I have borne in mind, the same sentiments that you displayed while settling matters amicably. Unity is a vital factor for the sustenance of our nation. Going by our constitution, what we have built up is a socialist democratic republic nation. Only if Advani and Modi use their ideals unitedly for forging ahead a liberated nation, will our unity and brotherhood be sustained. Our nation does not need the growth model put before us by Western forces, nor do we require their over-lordship. I had also written a letter to the Managing Director of Mathrubhumi, Vireendra Kumar. It was written before Advani ‘s withdrawal of his resignation. Enclosing a copy of the same, for you to go through. I strongly believe that Bharat will be an exemplar by being a role model for other nations to emulate. I would like to hear your views and observations regarding the same. Let me first thank you for your letter to me containing the most reverential advice. Even though the letter has been addressed to a specific person, its contents form a vital piece of counsel to all who function on a social platform. I agree with you whole heartedly, regarding the concluding parts of the letter. I would like to spend sometime in your presence, during my next visit to Kerala. This kind of a meeting, I strongly believe, will be enlightening, nourishing and disciplining. May satsangs like these pave the way towards the attainment of our common goal of Bharat being the 'Jagadguru'.